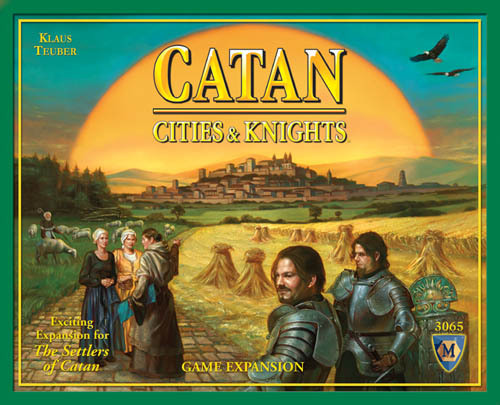 We played Settlers of Catan Cities and Knights. One of our favourite variant of Settlers of Catan. We have some expert players and if you want to join in expect tough competition. But you can always play one strong opponent against the other. For a review of the game see Boardgamegeek. The use of city development and commodity cards opens the way for much more in our favourite variant. A cracking game of a 4 player Cities and Knights Settlers of Catan last week. There was a last minute rush to the wire at the end. One of the club’s favourite games which is played often. It’s good to have new experienced players along to give it a new aspect. This one was tougher than usual. The winner got there by building upgraded knights quickly and getting 3 VPs plus 6 for cities a merchant and 2 for a 5 resource city. others were close on behind.